Luke Skywalker: We'll never get it out now! Yoda: So certain are you. Always with you it cannot be done. Hear you nothing that I say?" The 4502 X-Wing Fighter set was released in 2004 as part of the Original Trilogy subtheme of Star Wars. There have been many X-Wing based sets released since The Lego Group acquired the Star Wars license and began to produce Lego sets based on what is probably the most popular movie franchise in history. In fact this set was the 4th large version X-Wing to be released and there have been another 3 since, so it sits right in the middle. What distinguishes this model from its X-Wing peers is that it is based on the X-Wing that Luke Skywalker piloted to Degobah in search of Yoda. The ship becomes buried in the swamp and this set depicts that with green vine pieces draped over parts of the ship. You also get Yoda’s hut to build so you can recreate the Degobah setting. This is the only set we’ve seen released that contains Yoda’s little hut and it’s a great point of difference. The set makes a great first impression. It is easily recognisable as an X-Wing, which is something even non-fans of Star Wars will probably be able to see. For those with finer knowledge of the Star Wars universe, the ship and Yoda’s hut will immediately conjure up the scenes from the movie on which it is based. The size of the ship is impressive given it’s modest 563 piece count (some of which go to the hut). It may not be the largest or most detailed Star Wars model or even X-Wing around, but it does have a decent amount of wow factor and rather than just being a generic ship, it links to that specific movie reference. Luke Skywalker – this is a unique version of Luke, so very rare. He’s in his Degobah training outfit as Yoda puts him through his paces. 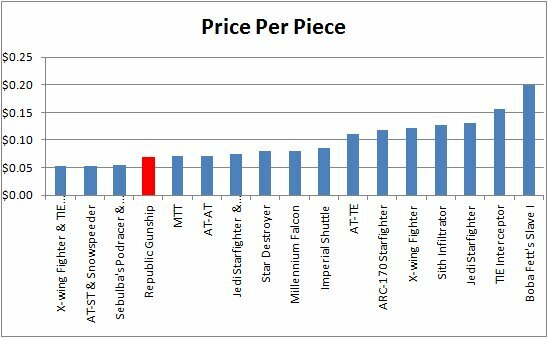 As such he commands a significant premium on the minifigure market with asking prices starting just under $30 for a new condition one. Many people collect Star Wars minifigures or even just a niche area like all versions of Luke and this one will be needed to complete those collections. A definite driver of set value here. Yoda – This version of the Jedi master is only available in 2 other fairly old sets. As such he is semi-rare and commands a small price premium on the minifigure market. R2-D2 – Everyone’s favourite little droid is included here, as he is in about a dozen other sets. So he is a very common minifigure. It’s nice that he’s included as it completes the trio of characters that complete the scene the set is based on. But there is no driver of set value from R2 as he is just too common. In terms of parts there are a couple of rare printed parts that are unique to this set that fetch a significant premium price. Firstly the most obvious one is the 8 x 8 Brown Radar Dish that has the tree branch pattern printed on it. This piece represents the roof of Yoda’s hut. It is priced at almost $5 in new condition. The other piece is a 1 x 2 Dark Grey tile that has a bedroll pattern printed on it. This piece commands around $11 when sold in new condition, very expensive for such a small piece. The uniqueness of these two pieces underpins their desirability and price, this in turn helps drive the price of new condition sealed sets. There are a couple of other printed pieces (no stickers back in these days, just good printed bricks!) that have small premiums attached but nothing like the two I’ve discussed. The rest of the set comprises of a good mix of popular colors. Black, dark & light grey, blue, red, green, white, brown, and tan are all well represented. It would be a good set to build other things out of due to the many colors available. It may add a little value, but I couldn’t readily see and part/color combinations that were extremely rare. Although the greys are the old type that was retired and replaced by the bluish grey shades, so is a little rarer and may be a little more sought after. Building the set from the 563 pieces shouldn’t take longer than a couple of hours if you are taking your time. Nothing overly complicated in terms of technique. Attaching the green vines, building the working wing mechanism from technic gears and rubber bands, and putting the roof on the hut are the high points. There is that familiar feeling of accomplishment when done as you look upon your work, something that Lego builders will know all about in ways that are difficult to describe. The finished model has a great amount of playability. The minifigures provide the main play options. Recreating the familiar training scenes from Empire Strikes Back as Luke begins to master his Jedi abilities. Have him use the force to lift R2, put Yoda on his back and go for a “run”, try lifting the X-Wing from the swamp and fail, then get Yoda to do it. (“Do or do not, there is no try!”). Lie Yoda down in his hut for a “sleep”, or even just play with the X-Wing itself and its many great features, the play abilities are varied and many. Luke Skywalker: Master, moving stones around is one thing. This is totally different. Retailing at $50 new this set was well under the accepted benchmark of $0.10 per piece at $0.089. On first glance this represents very good value for money. There are also the 3 minifigures to factor in, which means you got them for $17 per minifigure if you averaged it over the set. There is a bit of a loose rule that $10 per minifigure is good value, so we are a bit over that, but only the three of them are needed to complete the scene. None of the minifigures would require a new mold I don’t think, but the unique printing on Luke adds a bit to the production budget. Price per gram was $0.055 which is also very good. So I think we can say that value for money at retail was overall quite good. The set was not exclusive to any particular retailer. Just a standard 2004 release across all Lego retailers. Nothing much to add to potential value here to really pump up the secondary market value through scarcity of supply. There were two versions of this box available. The “Original Trilogy edition” was colored black around the edges and was square in shape. The other was the “blue box” edition and as the moniker suggests, had a blue edge to it. The Blue Box edition was more common and the other box is sometimes reffered to as set number 4502-2. Both had a picture on the front showing Yoda lifting the X-Wing out of the swamp as Luke and R2 look on, with Yoda’s hut in the background. A nice piece of artwork that depicts the movie scene the set is design on very well. As I mentioned previously there was only a couple of boxes (both blue boxes) for sale on Bricklink that I could see at time of writing and the chepest new one was asking $19.47. Perhaps a little unrealistic for a box of this size on a fairly old set like this. Though the scarcity of the box is possibly a small driving factor for the overall value of the set in new condition. Luke Skywalker: [tired] I can't. It's too big. Yoda: Size matters not. Look at me. Judge me by my size, do you, hmm? And well you should not, for my ally is the Force. And a powerful ally it is. …You must feel the Force around you. Everywhere. Here, between you, me, the tree, the rock, everywhere. Yes, even between the land and the ship. This set has had a CAGR of 12.39% over the 9 years since its release. That is a good growth rate for a set of this age and represents a return of 186% on initial investment (ROI) if you bought one at retail (or 2.9 times retail price if you prefer that measure). Not many Lego sets have sustained that level of price growth for such a period after the end of its retail life. If you bought the set at a discount, lets conservatively say 20% off, then that would mean an ROI of 258% (3.6 times the price you paid for it). No doubt this set would have seen such discounts and perhaps more over its retail life. In fact, as an exercise, lets look at a realistic best case scenario; 2 year shelf life at retail and a 25% off (it could even have been more perhaps?) sale at the end of its life to clear stock. So you buy it at that time and your CAGR would be 21.1%, ROI of 281% (3.8 times retail). A very good result. We only have two months to work with so there isn’t much in the way of time trends to analyse yet, but our ability to do so will improve as we move forward gathering more of this data. What we do see is a fairly wide gap of sales points for April and the narrowing for May. Condition of new sets can vary somewhat and will account for some of that price variation as a mint set will probably sell for more than a set with plenty of wear or damage to a box. Though the information does tell us that buyers are willing to pay up to perhaps $185 for a good set. If you had a set to sell you could price it accordingly along the scale depending on your sets condition and possibly other factors such as your Ebay reputation. 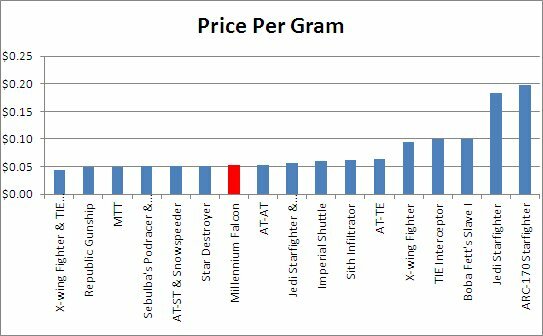 The graph also represents the -3.46% growth that was mentioned above by a drop in the mean (Current Market Price) from $148.40 to $143.00. From the evidence presented it would be easy to conclude that the times of growth are over for this set. The recent trend of negative growth would suggest that. Certainly in the short term while the impacts of 9493 are still being felt and the new impacts of the 10240 UCS are yet to truly kick in. However, I think that once the two current retail sets retire we may see this set return to a decent growth path – at least until the next inevitable X-Wing set is released! If there is a window of no X-Wings on the retail shelf it will help. The new Star Wars movies may also help somewhat. It is unknown if the X-Wing will feature in them but it seems as good a bet as any ship to do so. This set looks great on display. It’s a decent sized replica of one of the most iconic ships from the Star Wars universe. The unique swamp setting and features set it apart from other X-Wing model and add that touch of authenticity. The hut and minifigures just add to the picture and really help to set the scene. Sure the ship itself may not be as large or accurate as the latest X-Wing available or definitely the two UCS X-Wings we have been blessed with but this one feels unique and a little bit special. The display footprint is fairly large as it needs space to properly set the scene. Crowding it with other sets will make it feel a little lost on a shelf. Displayed proudly though this one is a winner and Star Wars fans will love it. Luke Skywalker: [astonished] I don't believe it! For me it’s the only X-Wing I own and the only one I really want to own. The scene takes me right back to one of my favourite parts of my favourite Star Wars film. Yoda training Luke is where we really began to understand The Force and the power it has in the Star Wars universe. 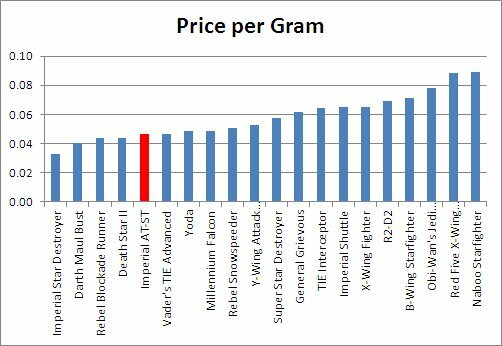 I don’t feel the need to buy and display another generic X-Wing. I have really enjoyed taking a looking at this set in detail and it’s a review I have been working off and on for quite some time as it’s been one of my favourite sets for a long time. From an investment standpoint there are some good points that have or should drive investment value, namely; Great minifigures and one that is unique and pricey, good value for money, a strong price growth history sustained over a long time period, accuracy to fan favourite movie settings, the unique Yoda’s hut, a very nice display piece, and the possibility of making a profit parting out the set. Whereas on the flipside of that there is the negative of a recent drop in growth brought on by another “case of the re-makes” which are almost certain to come again as the new UCS X-Wing bites. Personally I would be a little hesitant to buy one of these 4502 sets for investment right now, but if you can score a bargain you could make some profit by parting out if that’s your thing. Longer term if you wait a while the set will probably drop a bit further as the 10240 UCS demand bites, but if you grab one near the bottom of that curve you might get a decent period of growth before the next probable remake. That’s a fairly risky strategy that involves predicting a lot of timing to be successful though. In my opinion this X-Wing Fighter is stuck in the growth swamp and it’ll take a lot of force to lift it out. The AT-TE mini building set was released nine years ago in 2004. Being a small mini build set with only 63 pieces it’s hard to achieve much of a wow factor. Its small size means it won’t catch your eye and drag you over to it from across a room. The AT-TE is not really an iconic ship from the Star Wars universe and appears in the prequel trilogy and Clone Wars wider story arc. Many people won’t recognise it even if they are a casual Star Wars fan. Those who have a finer knowledge of the Star Wars material will probably recognise it for what it represents. Closer inspection of the model does give a small sense of wow in that you’ll be amazed how such a small model can look very detailed given the low piece count. It doesn’t wow me very much to be honest, I think it just looks like a box with some legs and stick guns. Parts wise there are no rare elements on offer here that would drive value greatly. There is a couple of printed pieces for the sides of the vehicle that are unique to the set but even they don’t seem to be commanding a premium price. The rest of the parts are mainly dark and light bluish gray, nothing to really add value here. This set did not include additional parts so you could make up ¼ of another ship when combined with the 3 other mini building sets in the series as some others in this subtheme have done. All 63 pieces are used in the AT-TE model. Building the set from the 63 pieces only takes a few minutes. You can’t really expect an outstanding build experience for a set this small. When building you do have to wonder a bit at the ingenuity of the designers in managing to create such an authentic looking model with so few pieces. That is a feature of the whole mini building subtheme and is very evident here. It still gives that small feeling of accomplishment when done, but not on the same scale as a large build might. The playability of the finished model is minimal. It is pretty small so can be flown around a room or “walked” along a flat surface easily but the small size doesn’t really lend any scale to the play time when paired with other ships or minifigures. Combining with other mini build ships might provide some extended play. The only real play features on the model are the gun turrets and adjustable legs so there are a couple of small things to add to the fun there. It is more of a small display piece than a functional play toy. Slipping one spot to be 12th out of 17, which shows slightly below average value for money when compared to similar sets. Parting out the set doesn’t look to be a winner either. Buying new sets at the current market price of $20.47 and selling the parts and instructions on Bricklink for approx $21.39 plus perhaps a couple of dollars for the box certainly doesn’t look to be a viable option. Even before accounting for the time to do so along with transaction and holding costs. Ranking 8th out of 17 puts our set just on the median for the subtheme. I was a little surprised with this result as I expected it to perform a bit lower given the copmpetition from other more iconic ships and I certainly expected the Imperial Shuttle, Slave I, Imperial Star Destroyer, and AT-AT to all be above it. Well that’s a very interesting picture! Prices for new in box sets sold on US Ebay have taken a bit of a dip over the last year and are now only just above the level they were 2 years ago. In fact the value for the set has dropped more than 15% in the last year. Comparing to the average for all 17 mini-build sets from the subtheme it can be seen that this trend is replicated across the range. 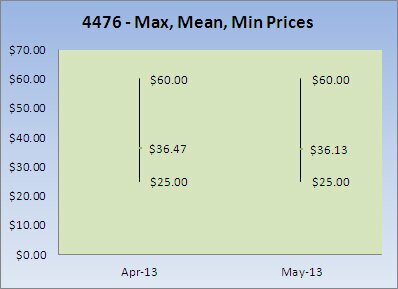 Our 4495 set has followed the trend of that average, but remained consistently above it during its secondary life span to date. 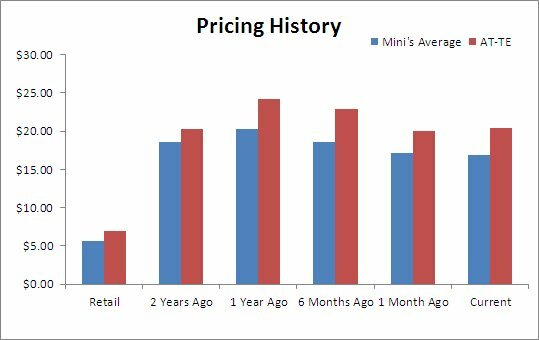 One major reason for this flat recent price growth could be the 20009 polybag mini-build set from 2009. That set was a Brickmaster Exclusive set so it is a little rarer but there is no doubt its release has taken some demand off our subject 4495 set. The recent flat growth does mean the evidence points to a future for this set of continued flat or very low growth. It may pick up a little but I wouldn’t envisage growth returning to the 12% levels. Returns of perhaps 3-4% or less seem more realistic. This may be underpinned a little if the new Star Wars movies help fuel demand for Star Wars Lego in general and this set may get more of a boost if we specifically see another AT-TE in action in the new trilogy. This particular set doesn’t really stand out at all the mainly grey coloring. Its blocky shape tends to result in it getting hidden amongst its other mini build friends when displayed with them. I know when I displayed the range together this one was one of the least looked upon. There is merit in marvelling at what can be achieved by the designers with such a small number of Lego elements. It would recommend avoiding investing in this set currently and liquidating any stock you may have on hand. Its growth has been stymied due to a remake and an overall drop in demand for the subtheme and its future growth looks certain to be pushed lower than its historical average suggests. AT-TE, not for me! The Republic Gunship mini building set was released ten years ago in 2003. Being a small mini build set with only 102 pieces it’s hard to achieve much of a wow factor. Its small size means it won’t catch your eye and drag you over to it from across a room. Its bright white and ark red coloring does help it stand out a little from the mainly grey vehicles that the Star wars theme usually offers. The Republic Gunship is not a hugely iconic ship from the Star Wars universe. Most people will not recognise it even if they are not a Star Wars fan. Those who have a finer knowledge of the Star Wars material will probably recognise it though. Closer inspection of the model does give a small sense of wow in that you’ll be amazed how such a small model can look very detailed given the low piece count. Parts wise there are no rare elements on offer here that would drive value greatly. There are a couple of lime green pieces which are relatively rare but don’t seem to be commanding a premium price. Even the piece that is only available in this set is easily obtained for less than $0.10. The rest of the parts are mainly white and light gray with a few black and dark red elements as well. It’s the older grey not the newer bley that is used so may hold value longer term for those wanting this shade. There are also some additional parts included in the set so you can make up ¼ of a Y-Wing Fighter when combined with the 3 other mini building sets in the series. The 4489 AT-AT, the 4488 Millennium Falcon, and the 4491 MTT. This is a great idea from Lego and meant people wanted to collect all 4 so they could build the 5th ship. A wise seller could look to pair a sale of this set with the others in a bundle to maximise potential value. Building the set from the 102 pieces only takes a few minutes. You can’t really expect an outstanding build experience for a set this small. When building you do have to wonder a bit at the ingenuity of the designers in managing to create such an authentic looking model with so few pieces. That is a feature of the whole mini building subtheme and is very evident here. It still gives that small feeling of accomplishment when done, but not on the same scale as a large build might. The playability of the finished model is minimal. It is pretty small so can be flown around a room easily but the small size doesn’t really lend any scale to the play time when paired with other ships or minifigures. Combining with other mini build ships might provide some extended play. The only real play features on the model are the hinged winged pieces so there isn’t much to add to the fun there. It is more of a small display piece than a functional play toy. Improving a couple of spots to be 2nd out of 17, which shows excellent value for money when compared to similar sets. The set does have a few larger and medium pieces than most mini build sets but still not enough to make it seem good value for money. This set is also the largest of all the 17 sets both in terms of weight and piece count. It is the only one that is over 100 pieces. That helps the value for money as the retail price point is held at $6.99 to be the same as the others in the same wave of release. Parting out the set may be worth investigating further. Buying new sets at the current market price of $17.07 and selling the parts and instructions on Bricklink for approx $23.40 plus perhaps a couple of dollars for the box certainly looks to be a profitable exercise. Although when accounting for the time to do so along with transaction and holding costs it make doing so far less worthwhile than first glance would suggest. Ranking 14th out of 17 puts our set near the bottom for the subtheme. Not being based on a very iconic ship and up against some stiff competition from the X-Wings, Millennium Falcons, and TIE ships means this set has obviously suffered as a result. Well that’s a very interesting picture! Prices for new in box sets sold on US Ebay have taken a bit of a dip over the last year and are now below the level they were 2 years ago. In fact the value for the set has dropped more than 24% in the last year. Comparing to the average for all 17 mini-build sets from the subtheme it can be seen that this trend is replicated across the range. Our 4490 set has followed the trend of that average, but the effect seems to have been greater as we started above the average and have now come down to be right in line with it. 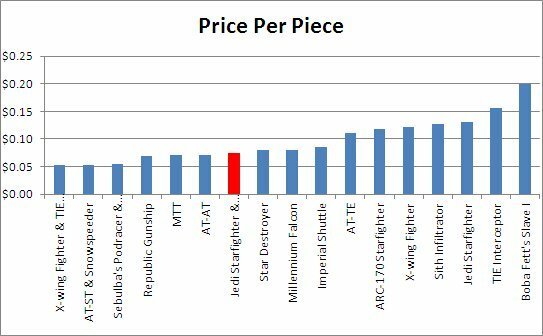 One major reason for this flat recent price growth could be the 20010 polybag mini-build set from 2009. That set was a Brickmaster Exclusive or a UK Lego Store only set so it is a little rarer but there is no doubt its release has taken some demand off our subject 4490 set. The recent flat growth does mean the evidence points to a future for this set of continued flat or very low growth. It may pick up a little but I wouldn’t envisage growth returning to the 9% levels. Returns of perhaps 0-2% or less seem more realistic. This may be underpinned a little if the new Star Wars movies help fuel demand for Star Wars Lego in general and this set may get more of a boost if we specifically see the Republic Gunship in action in the new trilogy. This particular set does stand out a little due to the white and dark red colorings. There is also merit in marvelling at what can be achieved by the designers with such a small number of Lego elements. Having a larger piece count than most other mini builds does help lend a bit of size and detail to the model compared to the others, even after taking out a few parts for the piece of the Y-Wing. It would recommend avoiding investing in this set currently and liquidating any stock you may have on hand. Its growth has been stymied due to a remake and an overall drop in demand for the subtheme and its future growth looks certain to be pushed lower than its historical average suggests. The Republic Gunship is not a Growthship! The Sith Infiltrator mini building set was released 9 years ago in 2004. Being a small mini build set with only 55 pieces it’s hard to achieve much of a wow factor. Its small size means it won’t catch your eye and drag you over to it from across a room. Parts wise there are no rare elements on offer here that would drive value greatly. There are a couple of printed pieces which command a small premium but even the 4x4 radar dish which has unique printing for this set is easily obtainable for less than $1. There are some sand blue colored parts that are a little rarer than mst but even they don’t seem to be priced highly at all. The rest of the parts are mainly light & dark bluish gray. This set did not include additional parts so you could make up ¼ of another ship when combined with the 3 other mini building sets in the series as some others in this subtheme have done. All 55 pieces are used in the Sith Infiltrator model. Building the set from the 55 pieces only takes a few minutes. You can’t really expect an outstanding build experience for a set this small. When building you do have to wonder a bit at the ingenuity of the designers in managing to create such an authentic looking model with so few pieces. That is a feature of the whole mini building subtheme and is very evident here. It still gives that small feeling of accomplishment when done, but not on the same scale as a large build might. The playability of the finished model is minimal. It is pretty small so can be flown around a room easily but the small size doesn’t really lend any scale to the play time when paired with other ships or minifigures. Combining with other mini build ships might provide some extended play. There aren’t really any “play features” per se on the model like moveable parts or hinged pieces so there isn’t anything to add to the fun there. It is more of a small display piece than a functional play toy. Improving a few spots to be 11th out of 17, which still shows below average value for money when compared to similar sets. The set does have a few larger and medium pieces than most mini build sets but still not enough to make it seem good value for money. Parting out the set doesn’t seem to offer anything either. Buying new sets at the current market price of $13.33 and selling the parts and instructions on Bricklink for approx $13.44 plus perhaps a couple of dollars for the box is certainly not a money making proposition. Especially when the time to do so along with transaction and holding costs would add to the difficulty of doing so. Ranking 16th out of 17 puts our set right near the bottom for the subtheme. Not being based on a very iconic ship and up against some stiff competition from the X-Wings, Millennium Flacons, and TIE ships means this set has obviously suffered as a result. Well that’s a very interesting picture! Prices for new in box sets sold on US Ebay have taken a bit of a dip over the last year and are now back to the level they were 2 years ago. In fact the value for the set has dropped almost 22% in the last year. 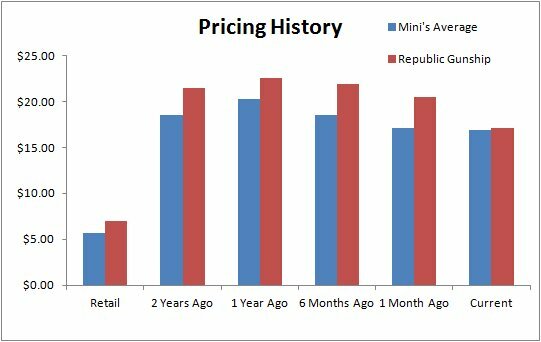 Comparing to the average for all 17 mini-build sets from the subtheme it can be seen that this trend is replicated across the range. Our 4493 set has followed the trend of that average. The reason for this flat recent price growth is hard to pinpoint. Unlike some of its other mini-build siblings the Sith Infiltrator has not had a major similar remake set released in recent times. There was a small mini build Sith Infiltrator released as an exclusive giveaway at the 2012 ComicCon so that would account for some demand drop but not a lot as that set is quite rare. However there have been two releases of other larger sized Sith Infiltrators since. 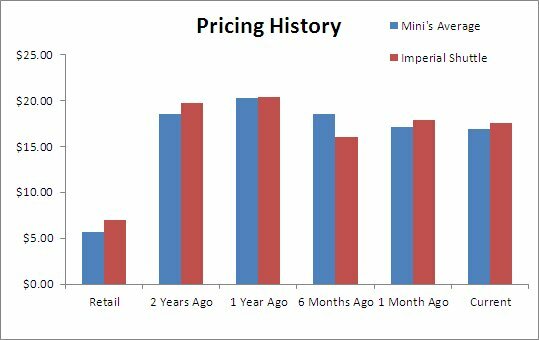 That would account for a little of the demand drop but not all as this mini-build set appeals to a bit of a niche segment of the market. 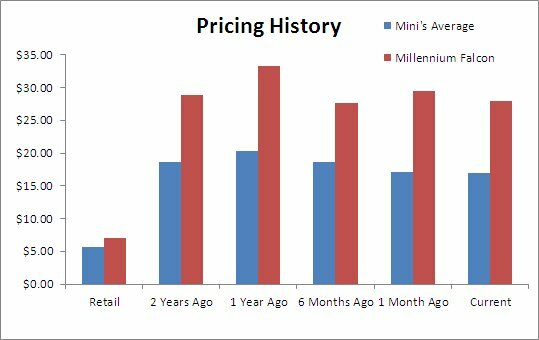 What we are seeing here may be a genuine peak in price growth for the set despite it not even reaching two times its original retail price. The recent flat growth does mean the evidence points to a future for this set of continued flat or very low growth. 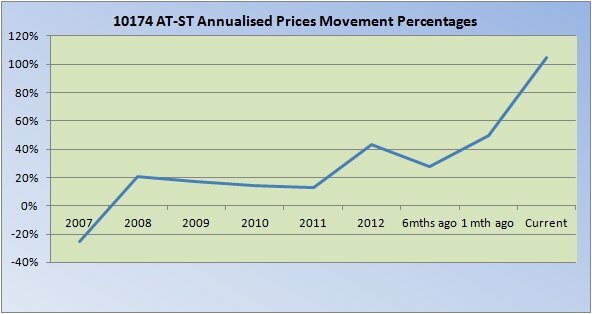 It may pick up a little but I wouldn’t envisage growth returning to the 7% levels. Returns of perhaps 0-2% or less seem more realistic. This may be underpinned a little if the new Star Wars movies help fuel demand for Star Wars Lego in general and this set may get more of a boost if we specifically see the Sith Infiltrator in action in the new trilogy. The display attributes of small mini scale built sets have both positive and negative potential aspects. Displaying this set next to normal sized sets or large minifigures scale models will put this one in the shade. It will be completely lost and out of place. However, putting them on their own shelf or display cabinet together does create a good display piece. Having such a small footprint means you can display many ships from the Star Wars universe all together easily. There are plenty of collectors who do just that. There is even the potential to display it alongside the many other different sized versions of the Millennium Flacon that are available in Lego form. This particular set does not really stand out due to the grey colorings and less well known subject. It does look like a nice sleek spaceship, but that’s about it really. There is also merit in marvelling at what can be achieved by the designers with such a small number of Lego elements. It is easy to recommend avoiding investing in this set currently and liquidating any stock you may have on hand. Its growth has been stymied for reasons that seem hard to determine and its future growth looks certain to be pushed lower than its historical average suggests. Don’t let the Sith Infiltrator drag you down to the dark side! The Millennium Falcon mini building set was released 10 years ago in 2003. Being a small mini build set with only 87 pieces it’s hard to achieve much of a wow factor. Its small size means it won’t catch your eye and drag you over to it from across a room. The Millennium Flacon is a hugely iconic ship from the Star Wars universe. Most people will recognise it even if they aren’t a Star Wars fan and those who have a finer knowledge of the Star Wars canon will spout movie quotes at her mere sight. Closer inspection of the model does give a small sense of wow in that you’ll be amazed how authentic such a small model can look. It really is brought to life by the large printed radar dish that adorns the top of the model. Parts wise the only rare element on offer here is the large 8x8 gray radar dish with the printing. It is unique to this set so does command a bit more value and can be hard to find. The cheapest new one on offer I could see was $3.75 but there wasn’t a lot of listing available so prices could vary. The rest of the parts are mainly light gray for the majority of the ship with a small scattering of black, blue and red parts that make up the internal structure. It’s the older grey not the newer bley that is used so may hold value longer term for those wanting this shade. There are also some additional parts included in the set so you can make up ¼ of a Y-Wing Fighter when combined with the 3 other mini building sets in the series. The 4489 AT-AT, the 4490 Republic Gunship, and the 4491 MTT. This is a great idea from Lego and meant people wanted to collect all 4 so they could build the 5th ship. A wise seller could look to pair a sale of this set with the others in a bundle to maximise potential value. Building the set from the 87 pieces only takes a few minutes. You can’t really expect an outstanding build experience for a set this small. When building you do have to wonder a bit at the ingenuity of the designers in managing to create such an authentic looking model with so few pieces, also considering some of the 87 pieces are used in the Y-Wing parts. That is a feature of the whole mini building subtheme but it is very evident here. It still gives that small feeling of accomplishment when done, but not on the same scale as a large build might. The playability of the finished model is minimal. It is pretty small so can be flown around a room easily but the small size doesn’t really lend any scale to the play time when paired with other ships or minifigures. There aren’t really any “play features” per se on the model like moveable parts or hinged pieces so there isn’t anything to add to the fun there. It is more of a small display piece than a functional play toy. Improving one spot to be 7th out of 17, which still shows average value for money when compared to similar sets. This is probably a result of this set having a few more medium and large pieces than some of the better ranked mini build siblings. Parting out the set may be worth looking into. Buying new sets at the current market price of $28.00 and selling the parts and instructions on Bricklink for approx $45.30 plus perhaps a couple of dollars for the box may be worth the effort. The time to do so along with transaction and holding costs would eat into some of those potential profits though. If you can get a few of these sets and part them out it may give you a good return if that’s your game. The set was not exclusive to any particular retailer. It was on most retail shelves for a year or two after release. Nothing much to add to potential value here. I remember when purchasing these locally that they seemed about average in stock levels on the shelves so again nothing to enhance the exclusivity of the set. Ranking 5th out of 17 puts our set well above the median for the subtheme. Being based on a truly iconic ship I was expecting it to do well but I was a little surprised to find it below other sets like the AT-St & Snowspeeder and the ARC-170. The reason for this flat recent price growth is hard to pinpoint. Unlike some of it’s other mini-build siblings the Millennium Falcon has not had a similar remake set released in recent times. However there have been four releases of other larger sized Millennium Falcons since. 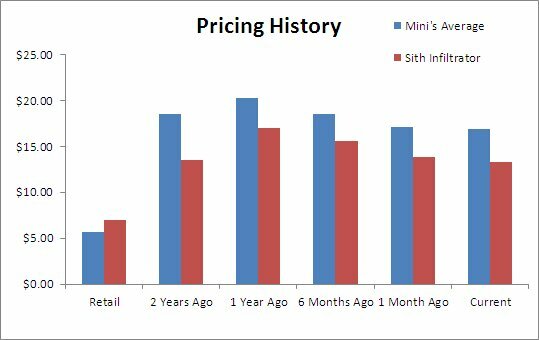 That would account for a little of the demand drop but not all as this mini-build set bellows to a bit of a niche segment of the market. 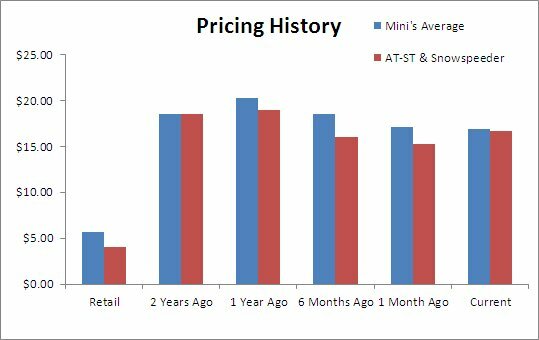 What we are seeing here may be a genuine peak in price growth for the set. 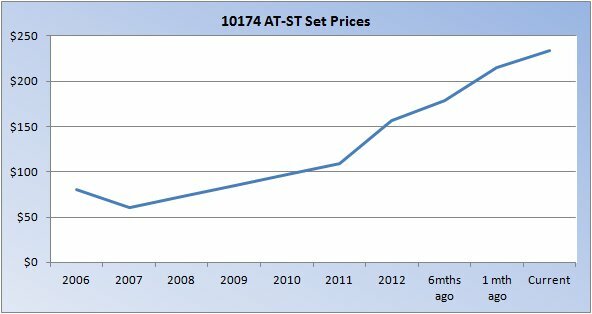 Once a set reaches four times its retail price it is hard to justify spending as much on an older set when a Lego buyer is constantly faced with nice new sets as alternative capture points for their limited discretionary spending. Almost $30 for 87 pieces of Lego may be hard to swallow for all but the die hard collector, wh possible already have the set anyway. The recent flat growth does mean the evidence points to a future for this set of continued flat or very low growth. It may pick up a little but I wouldn’t envisage growth returning to the 15% levels. Returns of perhaps 5% or less more realistic. This may be underpinned a little if the new Star Wars movies help fuel demand for Star Wars Lego in general and this set may get more of a boost if we specifically see the Millennium Falcon in action in the new trilogy. This particular set does stand out a little due to the iconic subject and the great printing on the top radar dish. Perhaps another 10-20 pieces would have pushed it to be great, especially as the set splits the pieces across two models and has some parts eaten up by the Y-Wing. There is also merit in marvelling at what can be achieved by the designers with such a small number of Lego elements. It’s been an interesting look at a small mini scale build released a decade ago during the beginnings of Star Wars Lego’s rise to greatness. Sets of this size are often overlooked by investors in favour of the better known flashier big models that are the stars of the Lego investment world. But smart investors know that there are solid profits to be made in small sets if you are willing to put in the hard graft (making sure you properly account for all those transaction costs of course). It is hard to recommend the mini Millennium Falcon set for current investment purposes. Its growth has been stymied for reasons that seem hard to determine and its future growth looks certain to be pushed lower than its very impressive historical average suggests. There is the fact that buying the set for parts could provide some value but unless you can find a few cheap deals it may be wiser investing in some different inventory at this point in time. She don’t look like much but she’s got it where… actually no she just don’t look like much! The AT-ST & Snowspeeder mini building set was released 10 years ago in 2003. Being a small mini build set with only 76 pieces it’s hard to achieve much of a wow factor. Its small size means it won’t catch your eye and drag you over to it from across a room. The AT-ST and Snowspeeder are fairly iconic ships from the Star Wars universe and I’d rank them as perhaps second tier in notoriety behind ships like the Millennium Falcon, X-Wing, Star Destroyer, and TIE Fighter. Most people will recognise them and those who have a finer knowledge of the Star Wars canon will know them instantly for what they are. Both vehicles play prominent roles in the Original Trilogy movies and are fan favourites of many. Parts wise there doesn’t seem to be anything incredibly rare on offer here. The parts are mainly greay for the AT_ST, and it’s the older grey not the newer bley that is used so may hold value longer term for those wanting this shade. The Snowspeeder is it’s traditional white and orange color scheme. There are a couple of printed parts, most notably the “face” of the AT-ST so that holds some lasting appeal. This set does also include additional parts so you could make up ¼ of TIE Bomber ship when combined with the 3 other mini building sets in the series (4484 X-Wing & TIE Advanced, 4487 Jedi Starfighter & Slave I, and 4485 Sebulba & Anakin’s Podracers). Building the set from the 76 pieces only takes a few minutes. You can’t really expect an outstanding build experience for a set this small. The pieces are all rather small as well so it can be a bit fiddly for those with large digits like me. When building it I did have a bit of a wonder at how the designers could create two distinct looking models that recreate their on screen versions so well with so few pieces, also considering some of the 76 pieces are used in the TIE Bomber parts. That is a feature of the whole mini building subtheme but it is even more evident here. It still gives that small feeling of accomplishment when done, but not on the same scale as a large build might. The playability of the finished models are ok. They are pretty tiny so can be flown or walked around a room easily but the small size doesn’t really lend any scale to the play time when paired with other ships or minifigures. The only real “play features” per se on the models is the moveable hinged legs and swivelling “head” on the AT-ST, but you need to have them in balance in order for it to stay standing. Tumbling back a few spots to be 5th out of 17, which still shows very good value for money when compared to similar sets. This is probably a result of this set having more medium sized pieces on average than it’s mini build siblings. Parting out the set may be worth looking into. Buying new sets at the current market price of $16.71 and selling the parts and instructions on Bricklink for approx $24.04 plus perhaps a couple of dollars for the box may be worth the effort. The time to do so along with transaction and holding costs would eat into some of those potential profits though. If you can get a few of these sets and part them out it may give you a bit of return if that’s your game. Ranking 4th out of 17 puts our set well above the median for the subtheme. Being based on two great ships I was expecting it to do well but I was a little surprised to find it above other sets like the Star Destroyer, and Millennium Falcon. Well that shows that things have cooled of quite a bit! Prices for new in box sets sold on US Ebay have taken a bit of a dip over the last year and are now just below the level they were 2 years ago after recovering slightly in the latest month. Comparing to the average for all 17 mini-build sets from the subtheme it can be seen that this trend is replicated across the range. Our 4486 set has taken a larger dip than the average but recovered back to be it’s equal again. 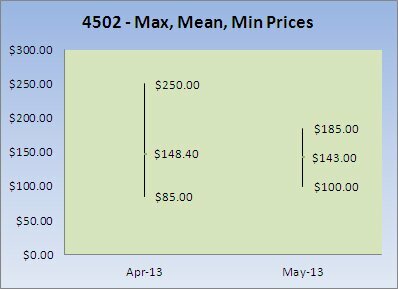 One major reason for this flat recent price growth could be the recently released 30054 AT-ST set in 2011. It is a slightly larger mini build polybag set that has 46 pieces dedicated to the AT-ST alone. Logically it makes sense that those wanting a mini-build AT-ST would opt for the newer cheaper version to the detriment of demand for our older set from 2003. Another consideration will be the 8029 mini Snowspeeder set released back in 2008 that presented a slightly larger mini build of the Snowspeeder as well. This set will have taken a small slice of demand as well. I do feel the 4486 set stands up well to both of them in terms of design though. The recent flat growth does mean the evidence points to a future for this set of continued flat or very low growth. 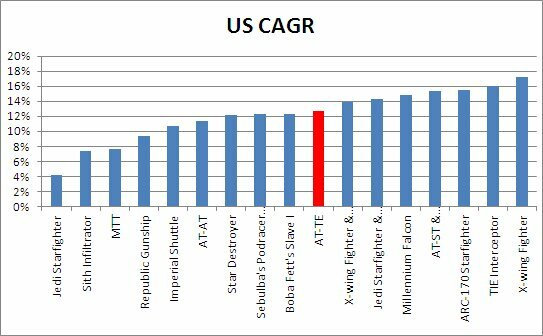 It may pick up a little now the initial hit from the newer AT-ST version should dissipate, but I wouldn’t envisage growth returning to the 15% levels. It will now have to share demand for AT-ST and Snowspeeder based sets with its rivals and returns of perhaps 6-8% are more realistic. This may be underpinned a little if the new Star Wars movies help fuel demand for Star Wars Lego in general and this set may get more of a boost if we specifically see the AT-ST or Snowspeeder make a new appearance. The display attributes of small mini scale built sets have both positive and negative potential aspects. Displaying this set next to normal sized sets or large minifigures scale models will put this one in the shade. It will be completely lost and out of place. However, putting them on their own shelf or display cabinet together does create a good display piece. Though the models in this set are small even for mini builds. Having such a small footprint means you can display many ships from the Star Wars universe all together easily. There are plenty of collectors who do just that. This particular set does stand out a little due to the height of the AT-ST which is probably the star here. I do think that they are one of the better mini build models available in terms of looks. Perhaps another 10-20 pieces would have pushed them to be great, especially as the set splits the pieces across two models and has some parts eaten up by the TIE bomber. There is also merit in marvelling at what can be achieved by the designers with such a small number of Lego elements. It is hard to recommend the mini AT-ST & Snowspeeder set for current investment purposes. Its growth has been stymied by a newly released similar set and its future growth looks set to be pushed lower than its historical average suggests. There is the fact that buying the set for parts could provide some value but unless you can find a few cheap deals it may be wiser investing in some different inventory at this point in time. The AT-ST needs to walk to higher growth ground and the Snowspeeder needs to deploy a tow cable to haul itself up the growth ladder. The Jedi Starfighter & Slave I mini building set was released 10 years ago in 2003. Being a small mini build set with only 53 pieces it’s hard to achieve much of a wow factor. Its small size means it won’t catch your eye and drag you over to it from across a room. The Jedi Starfighter isn’t a widely recognised ship from Star Wars whereas the Slave I is known for being the ship of the infamous bounty hunter Boba Fett, though perhaps not iconic also. Those who have a finer knowledge of the Star Wars canon will know them for what they are but there isn’t much to make an impression here especially with such small models even in comparison to other mini build sets. Parts wise there doesn’t seem to be anything incredibly rare on offer here. The parts are colourful for the most part with red, white, black, and dark blue making up the color scheme. Such a colour palette is not the norm for most Star Wars Lego sets, so it’s a nice point of difference to add some brighter colours to the mix. This set does also include additional parts so you could make up ¼ of TIE Bomber ship when combined with the 3 other mini building sets in the series (4484 X-Wing & TIE Advanced, 4486 AT-ST & Snowspeeder, and 4485 Sebulba & Anakin’s Podracers). Building the set from the 53 pieces only takes a few minutes. You can’t really expect an outstanding build experience for a set this small. The pieces are all rather small as well so it can be a bit trickier for apes with large mitts like myself. When building it I did have a bit of a wonder at how the designers could create two distinct looking ships that recreate their on screen versions so well with so few pieces, also considering some of the 53 are used in the TIE Bomber parts. That is a feature of the whole mini building subtheme but it is even more evident here. It still gives that small feeling of accomplishment when done, but not on the same scale as a large build might. The playability of the finished models are open to the imagination. They are pretty tiny so can be flown around a room easily but the small size doesn’t really lend any scale to the play time when paired with other ships or minifigures. There are no real “play features” per se on the model like moving turrets, gears, hinges, or opening compartments. Slipping a couple of spots to 9th out of 17, which shows this set represent about an average value for money when compared to similar sets. Parting out the set would probably not be worth the effort. Buying new sets at the current market price of $15.24 and selling the parts, instructions, and box on Bricklink for approx $16.43 doesn’t seem worth the effort. The time to do so along with transaction and holding costs would make doing so an almost certain loss maker. Ranking 6th out of 17 puts our set above the median for the subtheme. I expected this set to be ranked perhaps a little lower due to it not being based on an iconic ship. Definitely below the Star Destroyer, AT-AT, X-Wing, and Imperial Shuttle. Now that shows a different take on things! Prices for new in box sets sold on US Ebay have taken a bit of a dip over the last year and are now only just above the level they were 2 years ago. Comparing to the average for all 17 mini-build sets from the subtheme it can be seen that this trend is replicated across the range. Our 4487 set has actually not been hit quite as hard as the rest of the range it would seem. 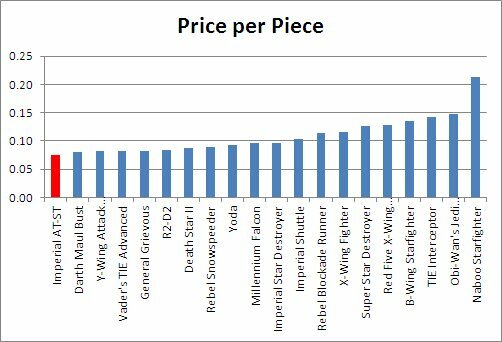 One major reason for this flat recent price growth could be the recently released 20019 Slave I set in 2011. It is a slightly larger mini build polybag set that has 76 pieces dedicated to the Slave I alone. Logically it makes sense that those wanting a mini-build Slave I would opt for the newer cheaper version to the detriment of demand for our older set from 2003. Another consideration may be the 6966 Jedi Starfighter mini build set released back in 2005 that presented a slightly larger mini build of the Jedi Starfighter that had a bit more detail, so may have taken a small slice of demand as well. The recent flat growth does mean the evidence points to a future for this set of continued flat or very low growth. It may pick up a little now the initial hit from the newer version should dissipate, but I wouldn’t envisage growth returning to the 14% levels. It will now have to share demand for Slave I based sets with its rivals and returns of perhaps 5% or less are more realistic. This may be underpinned a little if the new Star Wars movies help fuel demand for Star Wars Lego in general but this set may not get much of a boost specifically unless we see the Jedi Starfighter or Slave I make a new appearance. This particular set does stand out a little due to the bright colour scheme. I do think though that they are just lacking a little bit of finesse when compared to some of the other mini build models, especially the larger mini build versions of each of these ships when released as their own set. Perhaps another 30-40 pieces would have helped solve this, especially as the set splits the pieces across two models. Though there is merit in marvelling at what can be achieved by the designers with such a small number of Lego elements. 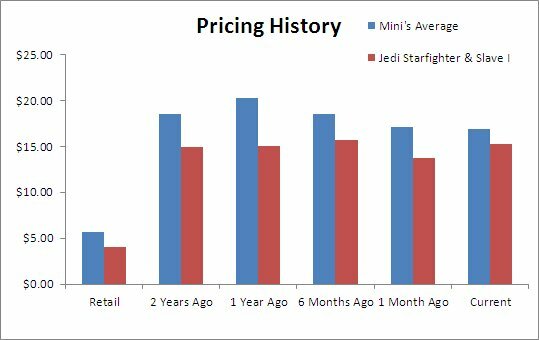 The mini Jedi Starfighter & Slave I set does not really warrant current investment. Its growth has been stymied by a newly released similar set and its future growth looks set to be pushed lower than its historical average suggests. There is little to push value in buying the set for parts either and unless you can find a few cheap deals I’d be investing in some different inventory at this point in time. The Starfighter has run out of fight and the Slave I has become enslaved in flat growth.